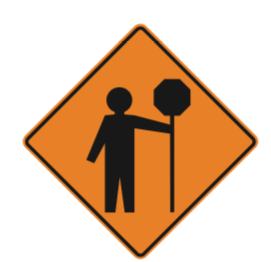 The octagon shape is unique to stop signs, no other sign has this shape. 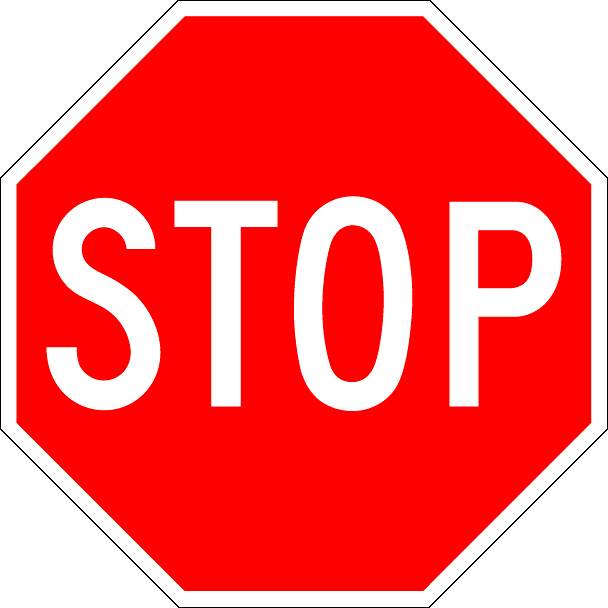 As drivers, when we appraoch a stop sign we are required to make a full STOP! 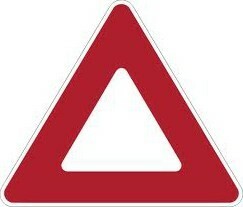 The inverted triangle represents our yield sign. Yield means you must give the right of way to other road users. 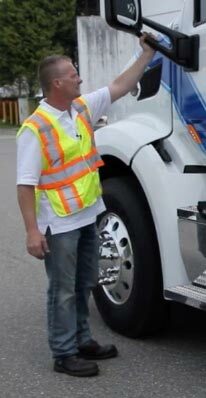 Yield signs also mean that a driver may proceed without stopping - provided that it is safe to do so. Less common to see is a regular triangle shape with the same configuration of colours as the yield sign. When this sign is displayed it means ‘caution’. 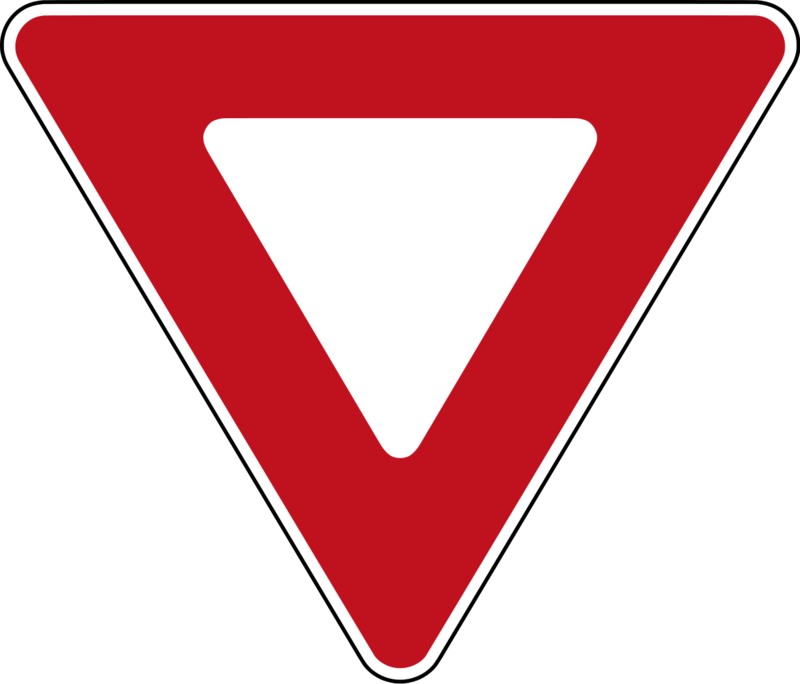 Drivers may see the upside-down yield sign when vehicles break down on the side of a road. 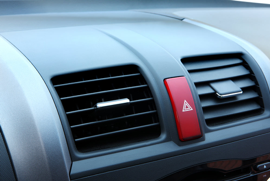 Have you ever noticed the 4-way hazard signal in your vehicle is also an upside-down yield sign? Again, this serves as a warning for other road users. This pentagon or “house” shape sign represents our school zone sign. 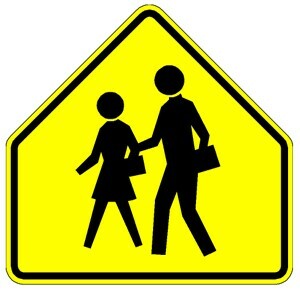 It’s unique shape allows drivers travelling in the opposite direction to easily idenitfy it and therefore determine when the school zone is no longer in effect. 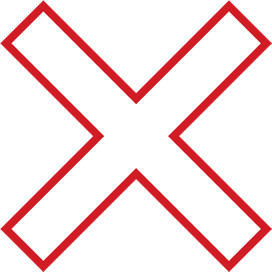 The Big X is called a crossbuck and they are used to indicate railway crossings. A Crossbuck means yield and only requires stopping when a train is present. Crossbucks may also be supplemented with additional warnings like flashing lights, bells and/or a gate that descends to prevent traffic from crossing the railroad tracks when trains are present. 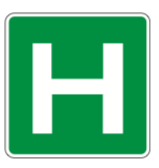 The background colour of road signs are intentional and the different colours represent different content. Knowing what each colour means will help direct your attention to the different signs when and where you need it. Signs with a white background are regulatory signs. We are required by law to follow and obey these signs. 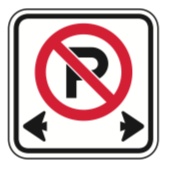 Failure to obey signs with a white background is against the law and is a ticketable offence. 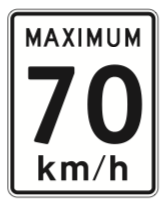 For example, posted speed limits or no parking signs could result in fines if disobeyed. Signs with a yellow background are warning signs. 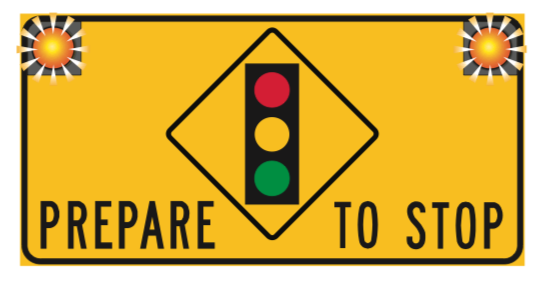 Signs with a yellow background warn drivers to have an increased level of awareness about the content they display. They warn us of potentials hazards, turns, traffic signals, etc. 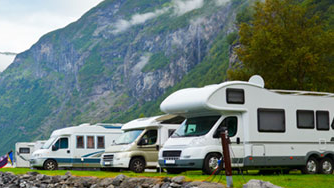 Some examples include signal lights ahead, winding roads ahead or roundabout ahead. Signs with an orange background warn of construction and maintenance work. 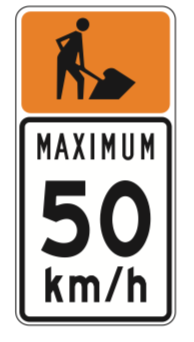 Drivers are required to obey the posted instruction on these signs, whether it is to obey flaggers or travel within a posted speed. In areas displaying orange signs, traffic fines double in price! Signs with a green background represent our informational signs. 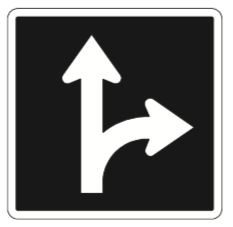 These signs outline distance, direction and route numbers. 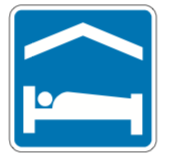 Blue background signs tell us of services, attractions, stops of interest, or places that you will find if you take a specific exit from a highway which is listed. 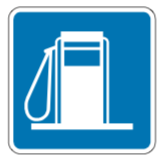 Blue background signs often provide information about lodging or fuel stations. Signs with black backgrounds are lane use signs. 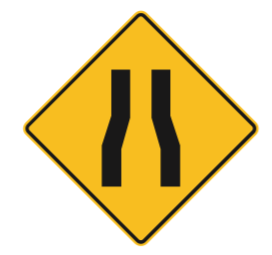 They show actions permitted in that lane and are mounted above the lane or beside the lane before the intersection. 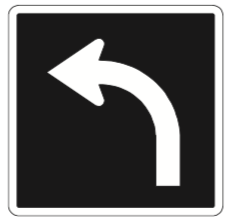 You must follow the direction indicated by the arrow on the sign when in that designated lane. 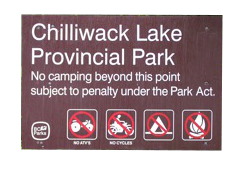 Brown background signs provide details about National and Provincial Parks found inside many of BC’s beautiful parks and campgrounds. Red or purple background signs are not overly common but they tell us of attractions such as amusment parks or wineries. You’ll see a lot of signs with red background when you enter areas that have a lot of wineries. In addition to the sign’s shape and colour, the message printed on the sign helps determine the meaning of the sign. The message tells us what to do either via written word (WRONG WAY) or via pictures (road narrows ahead). 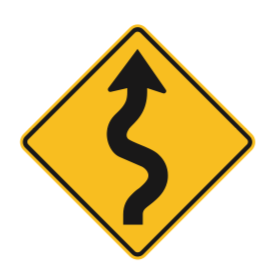 British Columbia is home to a number of unique road signs seldom seen during the regular daily commute or a leisurely Sunday drive. Below are some rare and fun signs that are out there along the roadsides of British Columbia. 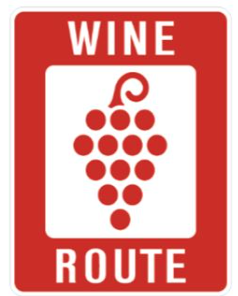 The Canadian agri-tourism road sign alerts drivers to places or stops of interest, as well as agricultural attractions like farm-to-table or cooperative markets, organic wineries, hop-growers, etc. The sign features a barn and silo structure, and a figure wearing a cowboy hat that appears to be showing others the barn. 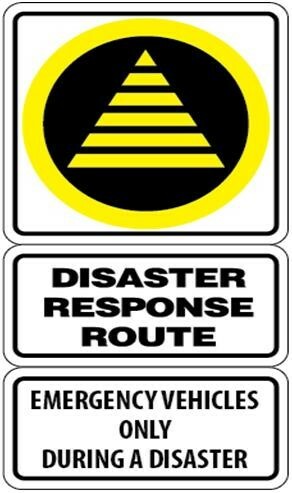 Primarily seen by drivers on Vancouver Island and in the Lower Mainland, the road sign for a designated disaster response route (DRR) is a standardized BC road sign indicating a route that is for the sole purpose of moving emergency supplies, equipment and personnel during a major disaster (environmental or otherwise). Misinterpretation has caused this sign to be revamped, now accompanied by a textual sign below that also explains and identifies the symbol. Welcome to Canada! 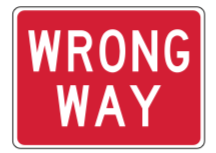 These signs are important to motorists who are within populated wildlife territory, and specifically for those who may be unfamiliar with the sheer mass of an adult bull moose. Regarded as one of the toughest and most dangerous animals in North America, and the largest member of the deer family, moose can easily weigh upwards of 1,500 pounds, and can seriously injure drivers and passengers. 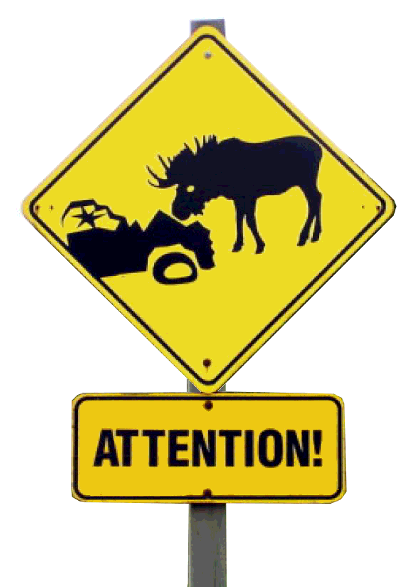 These signs are used in areas with large populations of moose and warn drivers to pay attention! In many BC communities, the provincial government has integrated traditional language names of towns and villages with First Nations languages, not only as a courtesy to growing numbers of local indigenous speakers, but also as a pathway to cultural understanding and reconciliation with Canada’s First Nations. 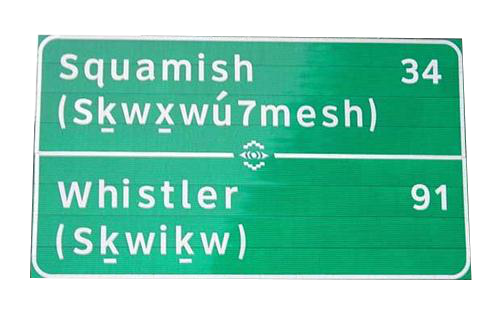 It’s not uncommon to see both the English and First Nations languages appear on highway signs, just as English and French may appear on highway signs in Ontario, Quebec, and New Brunswick. Some British Columbia mountain passes and roads require drivers (most often commerical drivers) to carry chains during the winter months for added traction and stability. 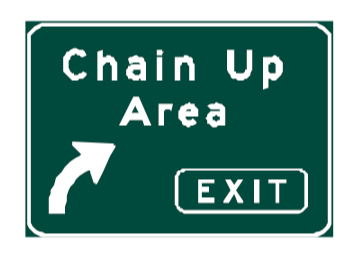 The Chain Up Area signs are used to direct drivers to a safe, cleared location where they can install tire chains, if required. 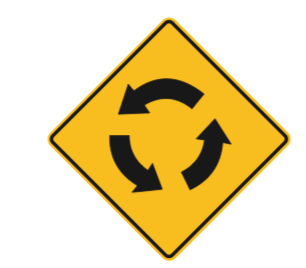 Signs both inform and educate drivers, making accurate interpretation of road signs necessary to help grow a population of safe drivers. Developing a knowledge of road signs and what the shape, colour and message means will broaden your skills and confidence as a driver.